Delighted Momma: Happy Labor Day! To be honest I had no idea it was even Labor Day weekend until Ian mentioned it to me on Friday. What I do know is...summer is almost over and I am pretty excited about it! I cant wait for all things fall! Want to hear our super awesome Labor Day plans? We have none. I think I might start figuring out what I want our themed family Halloween costume to be this year. Its a pretty big deal around here. Hope all of you hard worker bees are sleeping in, eating waffles and enjoying your day off. 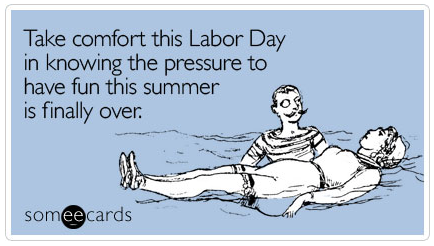 When you have school-aged kids (or are a teacher), Labor Day is a huge deal--the first long weekend off of school! Enjoy yours! I'm sure you'll think of the perfect costumes. I'm so glad we're not the only ones who haven't planned anything for the holiday! We slept in, but now it's time to get to work around the house! Enjoy your lazy day! Hope you come up with some great costumes this year! Can't wait to see what you choose! Sounds like a great day! I have to drive back to school in the rain, but it'll be so worth it for our Seersucker & Whites Labor Day partay! happy labor day lindsay! hope you are having a wonderful day with your family, i agree i think not wearing white after labor is definitely passe, bring it the white! cant wait for next month to see your gorgeous family's halloween costumes. my husband and i definitely slept in, rode our bikes to get coffee and donuts and enjoying this day off! Happy Labor Day weekend! Aren't weekends with nothing on the agena just amazing!?! Hope you enjoy it, friend! We don't have any plans either. Just a little shopping after the bug wakes up from her nap. We are boring. -- I cannot wait for Fall! Recipes, Decor oh my! Crafty DIY meet up soon? I can't wait for fall. Definitely my favorite season. Happy holiday, friend! We didn't really take a break from our labors today though--I made my husband bust out some projects. :) So worth it though. Hope this week goes wonderfully for you! Happy labor Day! I love the idea of a family themed Halloween costume. I don't have any kids, but it is a big deal around my house too. It must be the most fun holiday. Happy Labor Day girlie!! I am SO SO ready for fall too!! It was awesome to have a long weekend & especially awesome to wake up this morning to temps in the 50's!! Sadly, for us it's not going to last long but I'll take it.